Need a quick hairstyle for your morning? This low messy bun takes two minutes and looks adorable. Watch my video to see exactly how to do this easy hairstyle! A low messy bun is a quick and easy hairstyle you can do in two minutes. 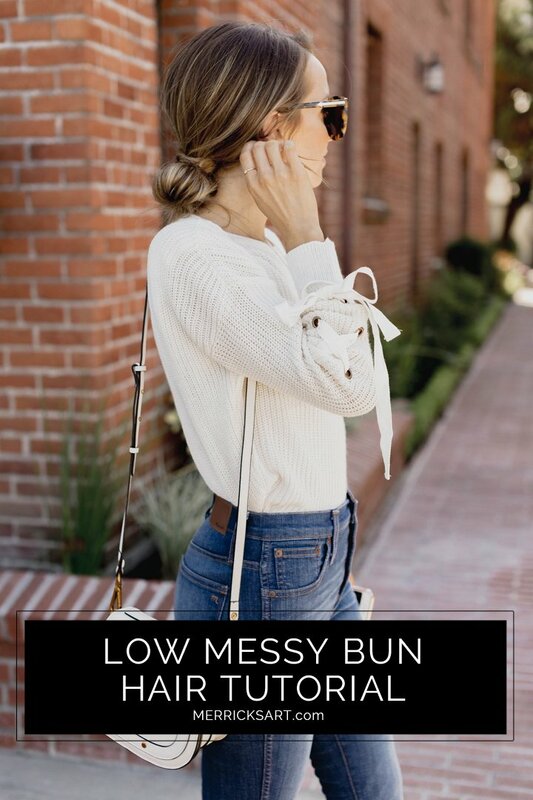 This low messy bun is one of my go-to’s for everyday hair. And the best part is that it’s a two minute hairstyle. So easy. You can do this with freshly washed hair, super dirty hair, or anything in between. And the best part is that it doesn’t create kinks in your hair like a high messy bun can. As a mom of three little kids and a busy schedule, this is a perfect easy hairstyle to do in the morning as I’m running out the door. I filmed this super quick video to show how I do it. 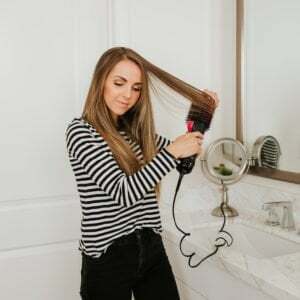 The spray I’m using is Kenra’s Dry Texture Spray and it’s great for giving your hair some body and texture. Check it out below, or on my youtube channel right here! Such a cute and easy tutorial. I wear a similar messy low bun at least once a week. I love a good top knot too! Thanks for this easy tutorial! I have to put my hair up more often these days because it just becomes a pouf in the rain, and I love how easy it is to accomplish this hair style. This bun is so perfect for a quick look! Great for an everyday look.